I have just come off a week away on holiday, which has been a good time to relax and clear my mind. So what is next now that we are back? As I get back into routine and tasks, what is next, what is the next thing to be done? Truthfully, I am reluctant to get back on that wheel of the next meeting to attend, the next task to do, the next job to go to. Or even to think about the next phase of my life and all the changes that could bring, or the next new thing to study and learn from God’s word, the next command to obey, the next comfort zone to leave, the next step of faith to take. I actually just want to stay in this little time of ‘post holiday contentment’ before life takes over. I’m not ready for the next yet. So, as I enter into today I will try and do so slowly, not rushing, but moving from one thing to the next and as I do so I pray that the next will flow and will glorify God. Lord, I give you my next. For me the word ‘lack’ conjures up negative pictures of want/need or emptiness. There is something I am lacking, something I need or want a physical/material thing, or something inside of me which is empty and needs filling up. Those empty places are my vulnerable places, those are the ones I may cry out to God for, but yet never utter to another soul, I may not even articulate them at all, but there is a lack, something is missing. Does God always fill those empty places? No. Does God always fulfill my physical needs? No He does not! Because in His mercy and in His Sovereignty, He knows what is best, He knows that the vulnerable spots, the empty places are what drive me to Him, are what keep me bound to Him. To always give me what I want is like spoiling a child, and not for the good of the child. So my Heavenly Father knows me and gives me all that I need, but not all that I want. I may lack some things, but in others, in Him I am rich. At the weekend I placed expectations upon someone, even knowing as I was doing so that they could not meet them. The result was that I was left disappointed and frustrated with myself as much as with the person. I was unrealistic in my expectation, I knew they could not meet or fulfill my needs. So what could/should I have done? First of all I think that I have to accept a situation/person as it is/they are and not somehow think that they are going to change out of the blue, even if I want them too, even if it would suit me if they did, even if it would be nice if they did, because the reality is that they have their own issues to deal with. Being realistic about the person/situation then means that I look and realise that my needs are not going to be met there. So I need to look elsewhere. Perhaps I need to look within myself, can I meet my own needs? Is there another person I can share with? Are my needs just purely selfish and self-centred in the first place? Have I just entered into self-pity mode, feeling sorry for myself? Do I just need to stop thinking about myself and turn to others, do a good deed to take me out of myself? Perhaps I should have applied the HALT principals. So in the midst of the frustration, perhaps I should have taken that step back, looked at these needs, attended to them then the outcome would have been better, nicer, kinder for everyone concerned. Perhaps also I am looking for a person to fill a need, which actually only God can fill. Perhaps I needed to cry out to God, perhaps I needed to take all my hurts, feelings and cares to Him and find my solace in Him, find my fulfillment in Him. Hopefully next time, I will HALT, I will turn to my Saviour and cry out to Him and look for my fulfillment in Him. Next time, I could choose to turn to Praise, I could choose to turn to rejoice and I could choose not sink into that frustrated, disappointed self-pity-party. Today even – I choose joy. So what is the measure I use to give? To give of my time, to give of my finances, to give of my gifts/skills? Do I have a sliding scale according to how much I like doing/giving of something ? Is it dependent on who I am doing it for, different ways for different people according to how much I like them or judge their need to be? My goodness! I realise how prejudiced I am and that I do limit how much I give depending on the people or situation. So what does the bible tell me? It tells me that by limiting my giving , I am infact limiting my own blessing! By limiting my giving to those I like or count worthy, I am limiting God’s blessing on my own life. By giving abundantly, giving generously, giving freely and without prejudice , then I will receive back much more than I ever gave out in the first place. The amount I give is the amount I will receive back! Pressed down, running over and poured into my lap! and give according to the measure I have been given by Christ. When our dog was a puppy we trained him using rewards as an incentive. So when he obeyed, he got one of those little puppy treats. When he behaved, he got a reward. He learnt through rewards. We do this with children as well, don’t we? We reward good behaviour with words of encouragement or treats. Does this then spill over to my spiritual life? Do I expect rewards from God? If I have been ‘good’, if I have been faithful in my quiet time, in going to church, in doing good deeds, do I expect a reward? Do I expect God to show me favour? Do I expect an extra blessing? Do I expect God to give me an easier life because I have been faithful and obedient? If so, then my thinking is wrong. My devotion, service and faithfulness to Him should all come out of a grateful heart, a heart full of love towards Him. His grace is unmerited, His favour is freely given, His mercy is extended in grace. I don’t deserve any of it. He should be enough for me. He Himself is my reward and with Him I should be eternally fulfilled and happy. Yes, I’m in that place once again. Once again weary and tired of doing things in my own strength, once again weary and tired of carrying worries and anxieties with me. So once again, I come to that place at the foot of the cross, once again humbled and broken. I come to that place where I can lay down my burdens, that place where I can lay down my anxieties, that place where I can find refreshment for my soul, that place where I can find healing balm, that place where my sins are forgiven. Once again broken and humbled. But in the right place, at the foot of the cross looking to Jesus. Are you in the right place today? Are you there at the foot of the cross? 16And Caleb said, “I will give my daughter Aksah in marriage to the man who attacks and captures Kiriath Sepher.” 17Othniel son of Kenaz, Caleb’s brother, took it; so Caleb gave his daughter Aksah to him in marriage. 19She replied, “Do me a special favor. Since you have given me land in the Negev, give me also springs of water.” So Caleb gave her the upper and lower springs. You see Aksah knew she had the land, had the inheritance, but she wanted more. She wanted her & her land to flourish, she wanted it to be watered, she wanted it to bear fruit, she wanted more. ‘Give me also springs of water’. The water which will well up and become life-giving, the water which refreshes our souls, the springs which remain constant and fresh and which won’t run dry. Lord give me also springs of water. Give me this water so that I can drink deeply of it, give me this water so that I can flourish, give me this water so that I can more than just survive, give me this water so that I can thrive and flourish for Your Glory. I’m not talking about the guilt we get when we do something wrong and of which we should repent, but of false guilt. We can get trapped in a cycle of this false guilt can’t we? What are the things which trap you, what do you feel guilty about? I feel guilt when I don’t meet someone else’s expectations . I feel guilt when I don’t match up to someone’s perceptions of me. I feel guilt when I feel I have let someone down. I feel guilt when I can’t do something I feel I should be able to do. I feel guilt when I can’t protect my children from the heartaches and trials of life. Yes, I seem to feel an awful lot of guilt! Guilt immobilises me and keep me bound in that cycle of feeling guilty, feeling I can’t do anything about it and so feel guilty about that! Phew how exhausting all that is! So what can I do, what can we do with all that guilt? There is now no condemnation for those in Christ. So if we have confessed our sin, if we have acknowledged all aspects of it, turned from it, asked for forgiveness then there is no condemnation from Jesus and if Jesus does not condemn us, then we should not be afraid of man’s condemnation. Sometimes we just have to let go of other people’s standards and expectations of us. It is their standards, theirs expectations and not ours, so we should not berate ourselves when we can’t match up to theirs. I have to walk my own walk humbly with my God. We can never match His standards, but Jesus can and has done so and through Jesus we are accepted and justified (just-as-if I never sinned). Now I can walk free from the guilt of having failed others, walk free from the guilt of not meeting expectations, walk free from the guilt that would entrap me and walk in the freedom of Jesus. God is just, good, fair, impartial, He hates evil, but loves justice. If so, why do I find myself explaining/justifying God’s actions/ways to others? If so, why do I feel I have to intervene and sort out situations instead of leaving them with God to act according to His justice and mercy. God is Just. Full stop . No need to explain, no need to intervene, just leave it, just trust, just believe, just wait till you see God work out His ways, just look at the cross. When I think of building I think of blocks one on top of the other. But in order to build you need a good foundation and that reminds me of the parable of the wise and foolish men. The wise man built his house on a good strong foundation, the foolish man on sand and when disaster struck, guess what? His house fell down! So for me I have to have my faith, my life built on a solid foundation, on Jesus Himself. This week the ill winds of pain and sorrow blew in, a situation which I have no control over again came into our lives and it is hard, it is sore, those ill winds are blowing mighty hard, but Praise God, we have not been shaken, our foundation is strong and sure in Jesus. As I get older my “where’s” get more frequent! Where are my car keys, where’s my jacket, where is that receipt, where have I put such and such a thing, where is it? Where has the time gone? Where are those precious moments with my children? Where has time passed me by? However, one thing I do not ask is, ‘Where is your God?’, for I know Him. I know that He is with me, I am more sure of that today than I have ever been. I can look back and through the trials and hardships of life I can see that the Man of Sorrows has been right there with me. “Where is your God?” they may say, and I will answer, He is here, Immanuel God with us, Jesus on the Cross proves, yes demonstrates God’s love for me. Where are you God? You are there on the Cross, suffering, redeeming, saving. Where is He?, He is right here in the every day, in the messiness of life. 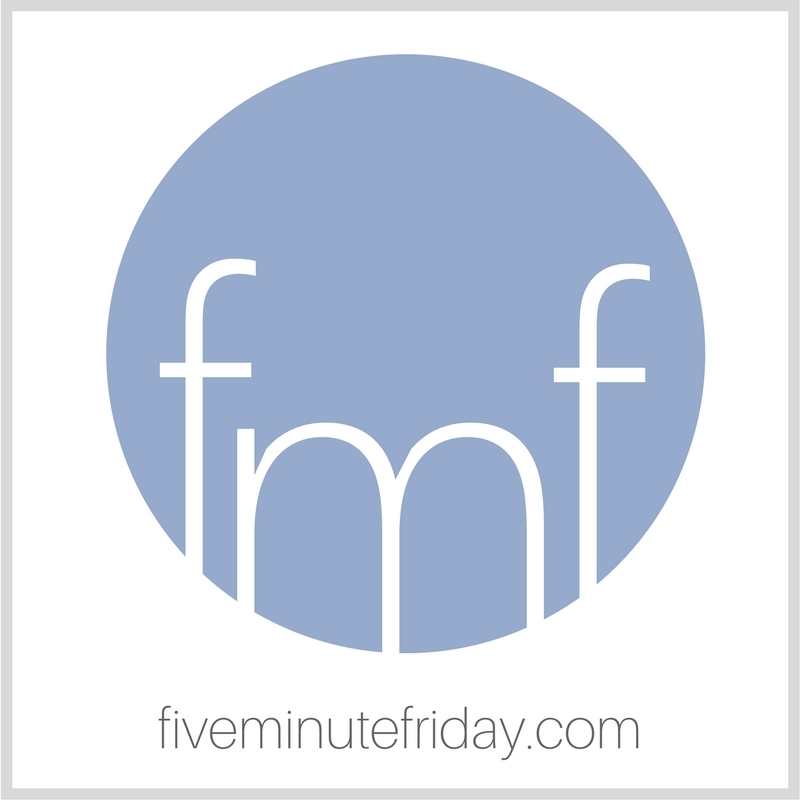 Today I am linking up with the women of Five Minute Friday. The idea is simple. Write for five minutes flat on the week’s posted topic. This week’s word is : convenient. I like things to be convenient, I like things to be at a convenient height for my shortness, I like things to be conveniently laid out for the morning so that I am not rushing, I like going to the local shop rather than drive to the supermarket because it is convenient. I like having visitors when it is convenient, I like meeting up with friends when it is convenient . But what about when it is a busy week and someone needs help, or an extra church meeting is called, or someone wants to come and stay.? How do I react when people and things get in the way and come at a time when they are not convenient.? Then I need grace, grace to be disturbed, Grace to go out when it is not convenient, Grace to extend mercy when it doesn’t suit me. I need to be saved from my convenient life and be willing to be stretched, flexible and expanded to live a reaching out kind of life, where others are put first before my convenience! Yes, it is that time of year again when people, myself included, have signed up for 5/10k running events and challenges, which means training time!! Groan, groan!! Do you know the hardest part of training for me? Doing it! Actually making the time, getting prepared and just getting out there is really, really hard! There are a 101 other things I think are more important or pressing for me to do and to put them aside to go for a training run is so difficult. It is a bit like reading your bible isn’t it? How many times have you vowed to start a new bible reading plan, or download a study or join a group or set aside a time of day, and it just never seems to happen! 101 other things get in the way. You sit down to pray and the phone rings or you suddenly remember something you were meant to have done. Always, always distractions. Yet, as with any training, once you start it is well worthy it. It is worth putting in the effort, it is worth carving out that time to do it. Once I have been my run, had my shower and am sitting having a cup of coffee and piece of toast I feel great and glad I made the effort to go out and do it. So too with Bible reading, it is well worth it, worth getting up early for, worth making that time, the benefits out-weigh the hardship. Being fed and refreshed in the Word of God makes the difference to your day, to your outlook, to your life. So just do it! Just put those 101 things out of the way and do it! Get into prayer, get into Bible Reading and actually you’ll find that those one hundred and one things still get done.! Like many of you, I always find New Year a time of reflection of the past year, but my thoughts are mainly of the year ahead – what will it hold? Sometimes we know, we may have plans, things to look forward to, there may be specific events already on the calendar, but from the day-to-day we often don’t know, the unexpected comes, our plans are thwarted or what looks like a blank calendar fills up all to quickly, or maybe not, maybe it stays blank for a long time. I am reminded of the words of Graham Kendrick’s song ‘For this I have Jesus‘ and I am comforted that no matter what happens I have Jesus. No matter the highs or lows Jesus will be there beside me and I am thankful for such reassurance. I pray that you too will know, that know matter what ‘for this we have Jesus‘ all through this next year of 2019. As I read the account of Jesus’ birth in Luke chapter 2, I am struck by the simplicity of it all. We are rushing round decorating our houses, buying presents, shopping for food, buying outfits for our parties and yet there was Jesus in the backwater of Bethlehem, away from the hustle and bustle even of the Inn, born, wrapped in cloths and laid in a manger! The difference is stark! We are looking for the luxury, He came in the lowly! For those who find our version of Christmas hard, for those sad and broken-hearted, take comfort for it was for You He came! Not in razzmatazz and glory, but in the stark and lowly. He left His place of glory and came to the place of lowly. For the sad, the lonely, the hurting, the broken, Jesus came. You may not feel like celebrating Christmas, and that is okay, but You can come to Jesus, born in a manger, born in obscurity, born in simplicity, born in starkness, born lowly. And indeed you will be more blessed, because you don’t have to hunt for Him through all the trappings, or through our self-sufficiency, but you can find Him in the lowly, in the starkness of the reality of your life . And be assured He will find you and reach down to you in that lowly place! So whatever our Christmas may look like, may it look like us being glad we have a Saviour, one who chose to come from the holy and chose to come to the lowly and in our self-sufficiency not forget our need of Him. God bless you and yours. Being confident is be assured of a thing, when relating to God it is a confident trust in Him. A quiet, confident trust which is like a deep assurance, which too ‘passes all understanding’, so that no matter the outward circumstances, no matter the appearance of a situation, there is a quiet confidence, a quiet trust in the Lord, that He is in control and He WILL work all things out. I am in need of that quiet confidence today. I am in need of that assurance of God’s sovereignty. So I fix my thoughts on God, I look to Him not the situation and I have that quiet confidence, that assurance that it is well, it is well with my soul!